Headline: The UK fleet of >5000 wind turbines provided 6.6% of peak electrical power requirements this winter. Winter 2013/14 has been characterized by strong westerly gales. The UK has invested heavily in new wind farms resulting in a total fleet of 10GW of installed capacity from over 5000 turbines. Such windy conditions are favorable to higher load capacity. Wind also takes priority over other fuels on the grid. 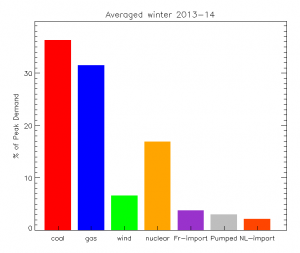 So how has our fleet of wind farms fared this winter ? I have been monitoring the national grid statistics for electricity generation every hour from late September 2013. 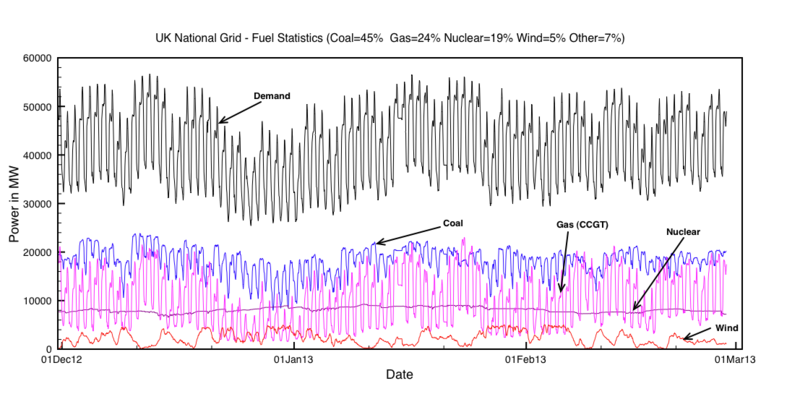 Demand for electricity must be met by supply in real time, so what really matters is the daily peak load on the grid. If demand cannot be met at peak demand then blackouts will occur. For each day over the last 7 months I have calculated the time of peak electricity demand and which fuels were used on the grid to provide the power demand. On average wind provided 6.6% of peak demand. However, when we look in detail at the daily fluctuations in wind we see a different story to that usually reported by the industry and the media. It is true that wind power records have been broken this winter during extended windy periods. As a result wind power has occasionally reached up to 14% of UK total demand. What is never reported though is that on other days there has essentially been zero wind power available at peak demand. This fact remains the real show stopper for wind power if we aim to maintain a modern technological society. Graph of percentage contribution from wind power to the peak power demands of the UK. Maximum power output of 14% represents 7GW, which is a load factor of 70%. Minimum power output was 0.2GW – load factor of 2%. This is the unsolved problem with wind power. Without any energy storage solution, wind cannot displace any fossil fuel plants because they are still needed in order to balance the grid. Wind energy produced at night is really paid for by consumers at double peak time rates but is then thrown away. This is the real scandal. Nuclear on the other hand has an inverse problem. Nuclear Power is a continuous process which is on both night and day. This means that nuclear cannot be used to balance wind. That is why all motorways have street lighting all night in Belgium, because it costs nothing since their nuclear energy is essentially free at night. The difference with wind is that nuclear is 100% reliable and we can plan to do something with that power. This makes nuclear a far more important energy source. Now we look in more detail at the demand and supply this winter. The next graph covers the period from September to March. The fuels used to generate peak electricity are plotted for each day. Wind has priority in that all available power is fed to the grid ahead of other fuels apart from nuclear. The fuel labelled “imported and pumped” is the sum of hydro power and and imported energy from France and Holland via the interconnection links. This winter it has been a one way traffic from them to us. France relies on Nuclear while Holland is building more coal power stations. The seven day oscillation is of course the variation between weekdays and weekends. Now we look in more detail at the high daily demand period of about 50GW during December and January with a noticeable strong dip over the Christmas break. The next plot is a daily additive stacked bar graph. It is interesting to note how the time of day for peak demand changes on Christmas day to lunchtime, whereas normally the peak demand always occurs around 5pm. Presumably this is simply because everyone is indoors cooking Christmas lunch. Detailed breakdown of Fuel sources for the Christmas period. During this period the UK experienced some severe winter storms and flooding. There is no doubt that wind energy does make a noticeable contribution to the grid – but one has to ask at what cost and what benefit ? Wind has increased roughly 2% compared to last winter but on the other hand we are now spending £6 billion per year in subsidies. The subsidies can only increase with future expansion, similar to those in Germany where annual energy prices are on average costing each household an extra €300 in subsidies. Doubling the number of turbines in the UK would increase the average yield to 12% of peak load, but would still do nothing to improve energy security. That is because sometimes there would still be < 1% of wind energy available at 5pm on the coldest day of the year, so not a single conventional plant could close without the risk of blackouts increasing. Independent of energy security, there are also serious environmental objections to a massive extension of wind farms in and around our small island. They are destroying some ancient peat and moorlands. They are ruining some of our best countryside and seascape views. Meanwhile the renewables lobby are pushing for ever more wind farms partly because they are risk free investments underwritten at our expense. The only low carbon strategy that makes any sense today is a rapid expansion of nuclear power, certainly not wind power. Economies of scale say we should instead be building 5 identical Hinkley Point C type stations all in parallel, thereby bringing on line 15GW of new reliable energy by 2020. Furthermore we could then also recharge everyone’s electric car overnight and light all our motorways for free! DECC chief scientist David Mackay has suggested instead using future electric car batteries to power the grid when there is no wind . Imagine waking up for work some mornings to find that your car battery is dead after a becalmed night! I somehow expect government cars will be exempted ! Relying on wind energy is like choosing to sail round the world rather than take the QE2. Sailing is great fun but the journey time is out of your control. You can be becalmed for days on end or be hit by a storm at 3am when you need to sleep. I am amazed that seemingly intelligent people can be so deluded about “green” energy. It really is as much a scam to defraud tax payers, than it is a remedy for climate change! This entry was posted in Energy, nuclear, renewables, Science, Technology, wind farms and tagged wind power. Bookmark the permalink. Clive, may I politely request that when you are referring to electricity generation you call it electricity generation and not plain “energy” or “peak energy”. The confusion between the contribution of wind to electricity generation and its contribution to total energy consumption in the UK permits ignorant warmists to believe and to claim that renewables contribute a far greater proportion of the national energy needs than is the case. 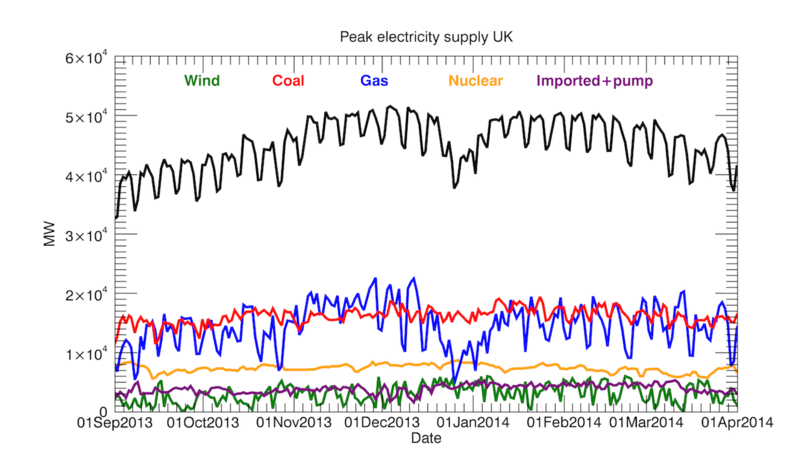 Electricity is just a small part of the total energy mix consumed in the UK. The 6.6% from wind turbines is just a very small proportion of that electricity. You are quite correct ! Everything above applies just to electricity generation. Total energy consumption is nearly 7 times larger than electricity alone. So in that case wind represents 1% of UK’s energy needs. If we spend twice as much money we can make it 2% ! According to BP wind power supplied 2.3% of total UK primary energy consumption (4.7 of 203.6 Mtoe) in 2012, the last year for which numbers are available. Clive: Good post. Quantifying the contribution of wind power at peak demand is an excellent way of putting the issue in perspective. The fact of the matter, however, is that wind power doesn’t “contribute” anything. It gets admitted to the grid only because CCGT and coal generation are cut back to make room for it, so all it actually does is change the generation mix. The power would still be available, and with a lot less hassle, if there was no wind power coming in at all. Added to that are the impacts of electricity spot pricing, which penalize conventional thermal generation sources to the point where the business of generating electricity from them is becoming unprofitable even at current low levels of wind penetration. Wind power is actually like a drug. The Greens say it’s good for us and people believe them, so we begin to shoot up. We start with small doses, and indeed they make us feel good, so we move on to larger doses and they make us feel even better. Then the doses get larger and larger and we feel better and better. And then one day we OD. Of course you are right. There is no rational reason for expanding wind power in the UK. Wind is inefficient, expensive and unreliable. Wind mills and water wheels were abandoned for this reason around 1850 after the development of steam engines. The only argument for wind power is that it is supposed to reduce carbon emissions. However it is not obvious to me that this is actually the case. To do a proper audit would need to include the hidden CO2 emissions of wind power. – The smelting of aluminium, production of concrete, mining rare earths etc. – Fossil fuels needed for construction and land clearance, access roads, transport etc. – Excess CO2 emissions from conventional plants running inefficiently to balance the grid from random fluctuations in wind output. The last point should be the show stopper. An Irish study found that if wind capacity reaches 20% of total generating capacity then CO2 emissions actually increase as more wind is connected. We are quite close to that limit now in the UK. The IPCC WG3 report calls for a tripling or quadrupling of ‘zero carbon’ energy to stop temperatures rising more than 2C. One would have to be barking mad to triple wind or solar power in Britain. Only a massive expansion of nuclear power makes any sense at all. The power outage across northern Scotland on Wednesday evening was probably caused by a sudden drop in the wind causing a part of the grid to trip. Coal is being used to balance wind output because coal is much cheaper than gas. It looks like coal was being ramped down in anticipation of a predicted rise in wind speeds. Then suddenly the wind dropped off at about 7:30 causing a drop in output. Some time around 8:30 supply to most of northern Scotland tripped. 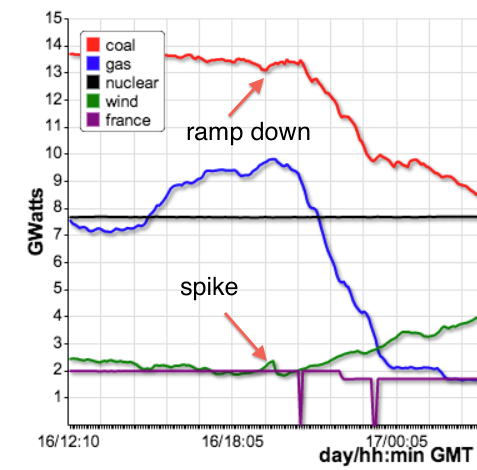 Soon after the wind output recovered and coal power was restored. Good post, but it is frustrating trying to get this across to the general public in the face of a lot of propaganda from a rather unholy mixture of vested interests and ideological bias. Wind turbines appeal to vague notions of being “free” and “natural” etc which can be hard to dislodge in a soundbite. After all, the wind is “always blowing somewhere” isn’t it? I recently made a presentation to the “Wells Men’s Breakfast Club” ( an august body of gentleman! ) and it was very well received because they had never seen so much information before, but that was a structured 30 minutes I could use to full effect. (A few had obviously come along to disagree but they were left speechless). If you’re interested I’ll see if I can get this up to you somehow (it’s a big PowerPoint file). It covers legislation, some physics, CO2 emissions, environmental effects (rare earths et al), impact on residents, some thoughts on the the Malthusian meme and an Executive Summary. Phew, I overran by a few minutes and took a lot of questions, but most were (very) convinced. By the way, the only thing I’d question in your post is the reference to subsidies of £6 billion. We’re at about £2 billion right now but heading to £6 billion as the renewables target for 2020 seeks 29GW of nameplate capacity from wind powered generation, delivering an average of about 8GW assuming a load factor of 28%. Or perhaps you have expanded into a calculation of a broader based subsidy level over and above the nominal amount ( there are arguments for that if you include grid adaptation etc ). The 6 million figure is the total expenditure on decarbonisation programmes so it includes PV panels and the CC committee etc. Does anyone know what the total power supplied by PV panels on roofs actually is ? I believe it is too small to measure. An Irish study found that if wind capacity reaches 20% of total generating capacity then CO2 emissions actually increase as more wind is connected. Please provide a link to this Irish study. Beyond 20%, attaching more wind power produces NEGATIVE benefits. It actually costs you more in wasted fuel on the rest of the system than the fuel saving the wind farms are producing. In other words, if you turned off the wind farm you would be generating the same amount of energy on the grid using less fuel overall for less cost. The 20% figure is shown by worked examples on the Irish Grid. The paper shows that with theoretical ideal best assumptions (not achievable in practice) you may be able to connect 30% wind to a grid, and with worst assumptions 5% before the cost benefit goes negative. If you read what I wrote carefully http://www.withouthotair.com/c26/page_189.shtml (before I became CSA to DECC, incidentally) you will see that I did *not* recommend running the grid from people’s car batteries (electric cars) when the wind stops. I considered the option of using electric-car-*charging* as a piece of demand that can be easily turned on and off. See also http://www.withouthotair.com/c26/page_195.shtml . Thanks for your response and sorry for the moderation delay (travelling). I think I was one of the first to buy your excellent book, and yes you are correct I am exaggerating the car battery argument. However if the grid balances demand to meet supply the end result could be the same. I suspect you really agree that a 100% renewable grid is unachievable. On the headline of your article, one thing that might be worth checking is whether your source for the amount of wind electricity delivered – “I have been monitoring the national grid statistics for electricity generation every hour from late September 2013” – includes *all* the UK’s wind, or only the largest wind farms that are directly connected to the National Grid. What is your source? (Quite a lot of wind capacity is “embedded”.) I have found it difficult or impossible to find the actual live hourly output of all the wind in the UK, so if you know a source that I don’t, I will be delighted. In addition I keep a 30 day average of the peak demand. And yes these only include metered large wind farms, but I don’t think it changes the basic argument. No matter how much we invest in wind there will always days with 2% load capacity. Only nuclear energy can deliver a low carbon future. David MacKay says “I have found it difficult or impossible to find the actual live hourly output of all the wind in the UK”. What an admission that is. The CSA to DECC doesn’t know how much generation we have from embedded generators, be they wind farms, wind turbines, solar panels etc etc!! It is frightening that the Government, DECC and DECC’s CSA have no idea how much electricity is being generated at any time. They have no idea of the implications of their policy of subsidising intermittent embedded generators. That is precisely why I have my own generator. Clive, the fact that you have only included metered (and thus large) wind farms, only serves to reinforce your arguments. That is because the metered wind farms are in the most windy areas of the country (mostly Scotland) and their performance (capacity factor) will be much higher than the embedded wind farms and wind turbines which are mostly sited in areas of poor wind resource. Clive, there is another missing “factor”, how much energy is supplied TO the Wind Turbines to keep them moving when the wind disappears? Or when it is very cold to keep them from icing up or freezing solid. The fact that they draw energy when not in use is hardly talked about. The whole situation makes my blood boil, especially when you add in BioMass Conversion and Ethanol production, the world has truly gone mad. Yes you are right. There are also the times when it is too windy and the turbines must be turned away from the wind and stopped to avoid damage. This too needs external power to implement. Of course none of this is made public. Another interesting audit is simply to count the number of turbines that are not turning on an average day with wind. These are the broken turbines . I estimate that at any given time up to 10% in a mature wind farm are broken awaiting maintenance. This is based on driving around UK. Clive, have you seen this turn around? What incredible hypocrisy ! First the government introduces a carbon tax to try to shut down coal stations and encourages DRAX to convert 2 of their boilers to burn wood by subsidizing them. Davey now apparently does a U-turn because it was a bonkers idea to start with. So all we need now is lot’s of environmentalists to say Wind Turbines are killing birds & bats and that should do for them as well and that would include sea birds of course. There is one aspect of wind power that many have ignored. Since wind output can vary within hours, one needs to have a back-up power source available to take over if the wind slows. All grids have a fossil fuel plant or two running in reserve mode ready to take up the slack if demand rises unexpectedly or if a plant goes down. Other plants are coming online in anticipation of peak demand or going offline as demand drops. Since the output of wind turbines theoretically varies with the cube of the wind speed, small changes in wind speed can have a big impact on output. If wind speed is 10% less than forecast, power output will be 30% less than projected. If wind speed is 20% less than forecast; 50% less power than expected. Suppose it takes 4 hours to bring a new fossil fuel plant online replace missing wind power and normally you can forecast wind speed to +/-10% over the next 4 hours with 99% accuracy. Then you need a fossil fuel plant running in reserve mode (spinning reserve) capable of replacing 30% of your forecast wind power. Unfortunately, 99% accuracy isn’t quite good enough; this is 3-4 outages a year. Regulators want the grid to have 99.7% reliability, and you really need a spinning reserve of 50% of projected wind power! Or you charge some large customers less for their electricity so that you can involuntarily disconnect then from the grid when you are short of power. As long as wind supplies a modest fraction of the grid’s power, one reserve is capable of backing up both wind and conventional power. Suppose however, that sometime the future on a windy day, you forecast having enough wind power to supply all of your demand. How big a reserve do you need? If could be 30-50% of total demand! And since the wind may not be blowing at all, you still need conventional plants capable of meeting 100% of demand plus a reserve. The take-home lesson is that X MW of wind power flowing into the grid goes not mean the CO2 needed to produce X MW of conventional power will not be emitted. The actual emissions savings depend on how accurately you can forecast wind output over the period it takes to bring more reserve power online. Which beings us to the definition of a “smart grid”: A system reducing demand when unreliable wind power fails to appear when needed by charging customers more for electricity. They also get charged for the cost of the grid and the spinning reserve that runs even when the forecast wind is blowing. As long as wind supplies a modest fraction of the grid’s power, one reserve is capable of backing up both wind and conventional power. Suppose however, that sometime the future on a windy day, you forecast having enough wind power to supply all of your demand. How big a reserve do you need? If could be 30-50% of total demand! I completely agree. It would be utter madness to increase the capacity of wind generation on the grid to over a maximum of 20%, because the costs become greater than benefits. Above 20% of peak demand wind power increases CO2 emissions, increases overall costs, reduces energy security, and threatens stability on the grid. `We are very close to 20% installed wind capacity in the UK (10GW). Adding new wind farms is futile unless someone can invent a cheap energy storage solution. We should call on the government to halt further expansion of wind power immediately. I am interested in where this 20% figure comes from – do you have a source? Yes – the source is a Phd thesis which studied the effects of wind impacts on the Irish grid. The author found that benefits of wind reduced to zero if net power was > 20% of demand. This is due to running gas stations inefficiently. I believe Clive was making two separate statements. Peak capacity is measured by local transmission area. Wind is generation is only practical in certain geographic (transmission) areas. If these areas represent 20% of the UK, for example, and the UK is already producing 20% of generation via wind then by math one could conclude that wind utilization potential has a peaked. I don’t know the actual figures but one can see the arithmetic. There are many hidden costs of wind power. If the wind is strong in Scotland and output from their wind farms exceeds 6GW the excess power is currently discarded. This is because the transmission lines to England can not handle more than about 4 GW. This can be overcome by spending more money on the Grid. The second problem is that if wind ‘capacity’ exceeds 20% of the grid – currently 12GW, then the costs and CO2 emissions of burning more gas to balance the stocahstic fluctuations exceed simply running the gas stations in stand alone mode. Thta was the result from the Irish study. Motivation by recognition is a marvelous thing.